Compared to two or three children, parenting one child is a lot easier in certain ways. As much as you try to make each of them feel equally loved and appreciated, one will still accuse you of showing favouritism. Luckily, there are some simple and effective measures that can help you deal with sibling jealousy. So, if you’re having problems in making your children understand that you’re not playing the favouritism card, jot down these five tips that will help you foster a harmonious relationship not just between your kids, but in your entire family as well. 1. Refrain from comparing the behaviour of your children. One simple way to avoid jealousy among siblings is to avoid comparing or praising one kid’s behaviour against his sibling, as it will only create a strain in their relationship. Moreover, you’ll end up pressuring the child that you praised while devaluing the other. 2. Listen fairly and openly to each of your children. Not only is this a powerful and effective way to show that you’re eager to hear all sides of the story, it also shows that you respect their thoughts. The key to building a good and fair relationship between your children is to show that you’re an unbiased listener and that you value each of their opinion, no matter how different it is. 3. Help them in nurturing each of their unique strengths. All a child wants is to be acknowledged and appreciated for their special talents. Find out the different talents that each of your children have based on their interests and natural temperament. Once you’ve already identified each of their talents, help them in cultivating it so that each of them gets to be acknowledged for their respective strengths. 4. Schedule a special bonding time with each child. Another good way to make your kids feel loved and treasured is to individually schedule a bonding time with them. Your bonding time can include watching his favourite movie, dining at your family-favourite restaurant, or just simply chatting together. This way, you get to stay updated not just on their daily activities, but in their personal lives as well. 5. Reinforce a cooperative behaviour between siblings. 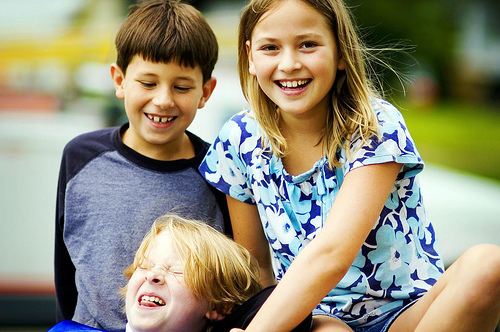 Boost the harmonious relationship between your kids by making them work together. Although there will be few moments where they’ll work hand-in-hand, don’t forget to tell them that you appreciate their efforts in helping each other out. That way, they’ll understand that harmoniously cooperating with each other is what you want them to do. Stop driving yourself crazy by always trying to make things fair in your home, especially between your kids. Instead, teach them the skills that will promote and nurture harmonious relationship between them, so that they’ll develop respect and affection for one another. This entry was posted on Tuesday, April 14th, 2015 at 8:24 am by Editor	and is filed under Parenting. You can follow any responses to this entry through the RSS 2.0 feed. You can skip to the end and leave a response. Pinging is currently not allowed.